A reward for buying so many copies of FM5 on Xbox One, say Turn 10 Studios. Turn 10 Studios has released a new free add-on for Forza Motorsport 5: the North American "Road America" track, as well as an accompanying Booster Pack. According to an Xbox blog post, Road America will feature four alternate ribbons to test players' limits, a first for the series. 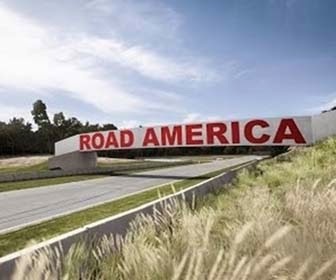 Road America will be added as a Career Event in the racing campaign, and Road America-themed events will also now be present in Rivals Mode and in the multiplayer lobbies. Additionally, the Road America Booster Pack is also available for free to current holders of a Car Pass. The pack contains five cars: the 2006 #2 Audi Sport North America R8, 1995 Chevrolet Corvette ZR-1, 1968 Ferrari 365 GTB/4, 1971 Ford Mustang Mach 1, and the 2009 Mercedes-Benz SL 65 AMG Black Series. Turn 10 says that the free add-on is to thank fans for their support; a full third of Xbox One owners own Forza Motorsport 5. In our 2013 review we said that "wrestling iconic cars around legendary tracks has never looked or felt this good on console."